Google Home ($129 at the Google Play Store) is one of our favorite smart speakers, but its dependence on power from a wall outlet limits its mobility. Ninety7’s Loft aims to solve that problem: It’s a battery that attaches to your existing Google Home to provide on-the-go power, so you can easily take it with you from room to room, or into the garage or yard—or even on the road if you want to use your Google Home as just a Bluetooth speaker. The Loft costs $49.95, but Ninety7 slashed that price tag to $29.95 for Black Friday/Cyber Monday, and it was still available for that price as of press time. When I first pulled this base out of the box, I was surprised by how light and sleek it is. Its simple design seamlessly integrates with the look of the Google Home, with a hard plastic outside and a smooth form that doesn’t get in the way of sound quality. It doesn’t add much weight to the speaker, so toting the combo around is a breeze. Another simple surprise? The setup itself. Connecting the battery base is fast and intuitive. You just remove the existing bottom from the speaker, line up the base, and snap it into place. Charging it is easy, too, since the Loft relies your Google Home’s existing cord. It should take around four hours to fully charge. The Loft’s rechargeable Lithium-ion battery can last all day: Eight to 10 hours, with occasional use. If you’ll be using it more heavily—listening to music at half volume for a full day, for example—you can expect somewhere between five and six hours of battery life. I do see a few areas for improvement in future versions. First, the Loft doesn’t have a USB port that would allow you to charge other devices—your smartphone, for instance—with its battery. That’s a feature that many portable Bluetooth speakers offer. Second, the battery base, like the smart speaker it connects to, isn’t weatherproof. Should you decide to use the speaker outdoors, you’ll need to take care that it doesn’t get wet. You probably shouldn’t plan on using it poolside. 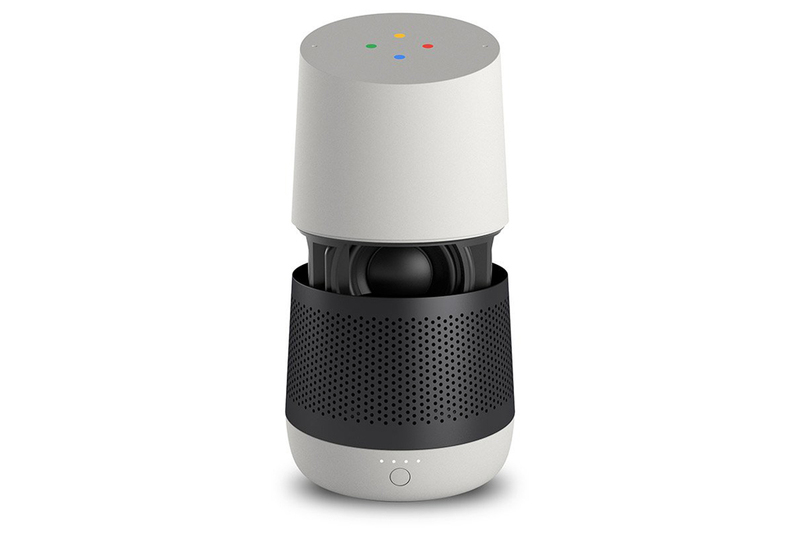 Those nitpicks aside, Ninety7’s Loft is a great accessory for a Google Home smart speaker, one that adds a great deal of flexibility to an already strong product. This simple, easy-to-use accessory renders the Google Home smart speaker portable, so you can take it all over your home without needing to worry about plugging it into an outlet.